That’s right folks, EasyParcel will be joining this annual crazy sale this year too! Get yourself ready, because up ahead are some of the best deal that you will ever see! Without further ado, let’s introduce you the exclusive deals that you can only get during this special period of time. Send an SMS automatically to keep your recipients informed on their shipment status, for free! Never forget to jot down the date on your calendar and be sure to lock down the deal as soon as possible so you can enjoy the promo for a longer duration. Let’s shop online and enjoy great savings this September! Register to Get FREE RM25 and Lock Down The Deal Now! This promotion is applicable for new top-up from 1st till 30th September 2018. For those who entitled this promo with EP100-EP1000, you’ll no longer enjoy RM5.90 for 5kg shipment, free Tracking SMS and RM5 nett for Pgeon Delivery on 1st October 2018. 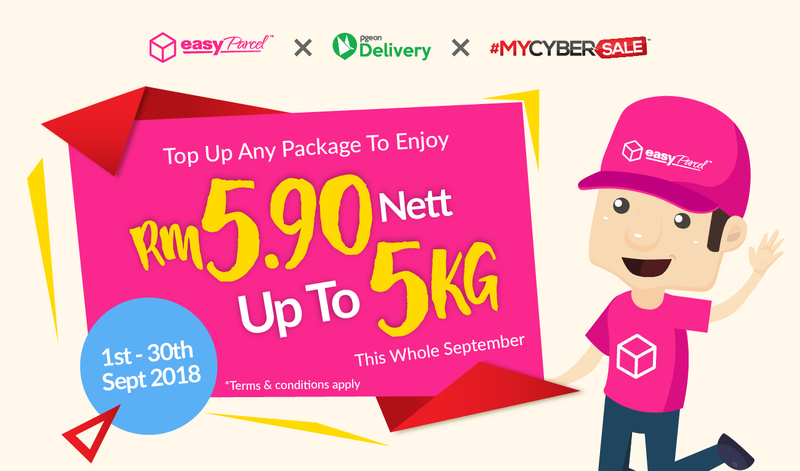 For those who entitled this promo with EP2000-EP20,000, you’ll continue to enjoy RM5.90 for 5kg shipment and free Tracking SMS till the end of your promo duration, except RM5 flat-rate for Pgeon Delivery till 30th September 2018. Merdeka FREEBIES Alert From EasyParcel!